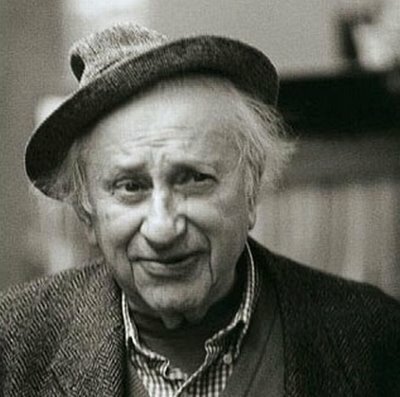 Author-radio host-actor-activist and Chicago symbol Louis “Studs” Terkel died today at his Chicago home at age 96. For a good article on his career, see the Chicago Tribune’s story by clicking HERE. I remember Studs vividly from my days in Chicago in 1961-2. He was broadcasting from station WLS, and it was my first time “on the air”. I had recently joined the Old Town School of Folk Music student body, and was hard at work learning some chops from Frank Hamilton, who was teaching guitar, and from Flemming Brown, who was teaching banjo in the room across the hall. It was simply a case of multi-tasking, trying to keep notes of each instructor, then practicing at home in my one room apartment on the near-North side about 4 blocks from Wrigley Field. A magician and writer named Bob Parrish took me under his wing and introduced me to Studs, and I showed up at the studio one evening with my nylon-strung Martin guitar to play some American folk songs. I don’t think the show was recorded — and I’m glad it wasn’t(! ), but Studs got me over my nervousness and we had a good time together. One reason we had a great time was because of the other guest that night, San Franciscan bluesman Jesse Fuller, who showed up with a twelve string guitar bigger than he was, his “Foot-Della” (a wooden box rigged with strings and pedals to play bass), plus a headset with a microphone and electrified harmonica and kazoo. The whoe thing was electrified, and gave off a steady, menacing, 60-cycle hum during his performance and interview, so that I was afraid he would be electrocuted upon biting into the rig. As I rode the “L” home from the studio that night, I really felt I had broken into show bizz in a big way. Those were the days! Studs, rest in peace, and thanks for giving an aspiring performer a place on your show. This entry was posted in News and tagged Chicago, Folk Music, Jesse Fuller, Radio, Studs Terkel, WLS. Bookmark the permalink.